Copa d’Oro cocktail bar’s Rhode Island Red. Grazie, Vincenzo Marianella! For bringing your special brand of cocktailing to the Westside. Because of Vincenzo’s new bar, Copa d’Oro cocktail bar, in Santa Monica, I don’t have to trek all the way across town for one of those fancy cocktails. You know, the ones you find at the Edison or Comme Ca. Vincenzo, noted “bar chef” of Providence, and Jonathan Chu of Buddha’s Belly have taken over that sad little spot that used to be Lounge 217. That douchy nightclub is now such a classy and chill lounge. Dimly lit, warm wood paneling, and lots of places to sit. You can sit in one of the two booths/rooms near the entrance or at one of the many tables or the center couches or on a barstool. Of course there were ample empty seats last night but that could be because not many people actually know that this bar is now open. Thrillist said it opened on Monday and UrbanDaddy has them down for opening tonight. And the folks at the bar said that they actually weren’t supposed to be open Monday or last night but decided to open their doors anyway, thank gawd. I was so glad they did because I got to see my old friend and fave bartender, Damian Windsor, again. He was my go-to guy at that downtown whiskey bar back in the day and I’ve been waiting for him to emerge from behind a bar ever since. Unfortunately, Damian is just helping out and will only be there through the end of February. But that just means I need to get to know Copa’s other bartenders. Not a problem. I’m sure they’re talented. They would have to be to work there. Because the cocktail menu isn’t just a list of standard cocktails. 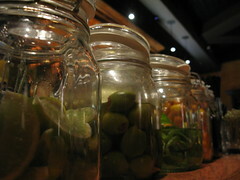 The front page is basically a list of ingredients, many of them straight from the Santa Monica farmer’s market, allowing you to either customize your own cocktail or leave your tastebuds in your bartender’s hands, so to speak. Overwhelmed by everything — the DIY mixology, the pages and pages of diverse cocktails — I asked Damian for a little help. I had pointed out one particular cocktail, called Diva, in the book that had bourbon in it but then it also listed a dark chocolate liqueur. “Is it just me or does that sound weird?” I asked him. He pondered it and said, “Yeah, yeah, it does. But that also has a lot of bourbon in it.” My ears perked up. Just then Vincenzo came over and said something into Damian’s ear. “Actually we don’t have that chocolate liqueur right now,” Damian tells me. That’s when he went on to explain that they’re still expecting lots of stuff as the bar hadn’t planned to be opened yet. Also, the five-panini menu mentioned on Thrillist doesn’t really happen until next week. Boo. Nope, no food here yet, except the tasty crackers that they set out on the tables. And good thing the cocktail Damian made for me had lots of strawberries in it. Yes, I was fortunate enough to get a taste of an award-winning Damian creation. His cognac Negroni called Grosso Sbagliato (The Big Mistake) won him a trip to France! The concoction is comprised of Hennessy cognac, Campari, Sweet Vermouth, Ricard and muddled strawberries. It had just enough tang to get my attention and I loved the way the Campari and cognac tasted together. Damian even set an orange peel aflame and dropped that in for a garnish. I sipped my cocktail while checking out the scene. Outside I could see people walking by the entrance and peeking in. Every now and then, someone would actually walk in and stand at the door for a moment while looking around the bar and then they would leave. I guess they’re just curious about the space. I, too, remember when it was Lounge 217. That small dance floor in the corner is now taken over by tables and chairs. The bar is longer and more prominent. There’s no longer a back lounge near the restrooms. And it is way classier. But the crowd wasn’t all dressed fancy or anything. No suits here. Rather, I felt comfortable arriving in what I wore to work. There is no dress code here. Complete opposite of 217. So for my next cocktail, I decided to go with one of the creations already listed. Something about the Rhode Island Red cocktail (#95 on my LA bucket list) got my attention. I think it was the combination of tequila and ginger beer. “That’s Vincenzo’s. 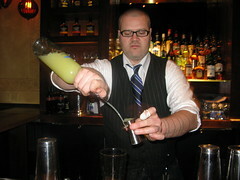 He won an award with that cocktail,” Damian informed me. Awesome! Made of Partida Blanco Tequila, Chambord, agave nectar, Bundaberg ginger beer, raspberries and lemon juice, it definitely was something special. So light, sparkly and flavorful. I really have to stop underestimating tequila. It actually tasted awesome in this drink. But damn, I am already in love with Copa d’Oro cocktail bar. 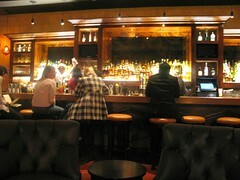 Not only can I now stay on my side of town to enjoy a well-crafted cocktail made with fresh ingredients for $9-$13, but I have a great place to wait out the rush hour traffic! Huzzah! I think I wanna go back there tonight. You should get to know Joe. That boy knows his stuff. OOOH! Thanks! I’m excited to try it. I trek from Hermosa on up to Hollywood for the Hungry Cat beverages!! sounds fun — I was looking at the DiY menu and already figure out what combo I wanna try (Partida tequila, habanero, basil, blackberries with raspberry soda); I’ll letcha know if that’s any good. Next time you go, Caroline, let me know! Love the review. Unfortunately I don’t know of anything like that in the South Bay. But H.C. might as he goes ALL over the place. Let’s go next Monday? Tuesday? I know that’s when Damian will be there. And yes, Monday sounds good though given where I work–7:30p would be my earliest make-able time. And dang, I’m already eyeing DineLA options in that area! Let me know if that’s something you two would be interested in as well. Monday it is. I’ll probably get there around 6:30 just cuz. See you then! Yay! Caroline on Crack | Dear Caroline on Crack: Where To Take Visiting Boozers?